bl.uk > Online Gallery Home	> Online exhibitions	> Asia, Pacific and Africa Collections	> A Backwater, Travancore. 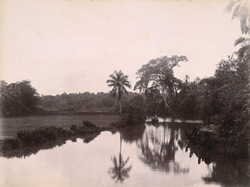 View of a local boat on a river in a swamp in Kerala, from the Kitchener of Khartoum Collection: Miscellaneous views in India, taken in the early 1900s. Kerala is a small state situated in the south west of India flanked by the Arabian Sea and the Western Ghat mountains. The area is geographically unique, comprising lush mountain scenery and a network of lakes, canals, estuaries and deltas of 41 rivers which are fed by two annual monsoons and drain into the Arabian Sea. The backwaters have traditionally been the highways of the state, linking remote villages and conveying goods, particularly coconut, rubber, rice and spices. The waters are a self-supporting Eco-system teeming with aquatic life.